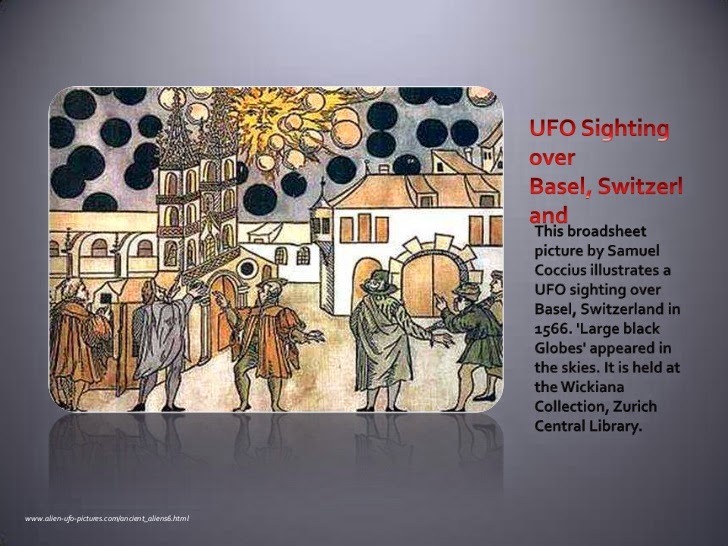 In Basel Switzerland on August 7, 1566, at dawn, many citizens were frightened when they witnessed black spheres involved in a formidable aerial battle for several hours. There was little doubt that the skies above their city had been invaded. It should be pointed out that the descriptions and woodcuts are attempts by artists nearly 500 years ago, to depict an event that they potentially could not comprehend. Some have pointed out that the woodcuts and descriptions of the event sound very much like a modern day "dogfight" between planes of opposing forces. The black circles in the woodcut look very similar to explosions in the sky as photographed by World War II reporters. In addition, the cross shaped vehicles look very similar to the profile of a World War II fighter ascending in a steep climb. As such, some have proposed that the events witnessed were actually old World War II battles and that some sort of slip in space/time allowed the 16th century town to witness an event that would not occur for another 400 years.